The Breezaire WKL6000 wine cellar cooling unit can be installed in a hole in the wall. The Breezaire WKL series of wine cellar cooling units features a cool green LED digital display with is large and easy to read can be set between 48 - 63 degrees. Temperature controlled by air sensors or the optional bottle probe. Power outage feature - delays cooling unit start up after power outage. Blocked airflow protection - shuts down the cooling unit in case of higher temperatures caused by condenser blockage or fan failure. Due to electronic differences, Breezaire does not recommend their "E" or "L" series for electrical requirements outside of the North American Standard. If you require the option of "cord out back", there is an upcharge & the unit becomes deemed as special order item. Please let us know when ordering, . The bottle probe is an option, please specify at time of ordering if you would like to add this to your order. Damage to the compressor and digital controls can occur when (1) power comes back on in less than 10 minutes from when it went down (2) when the power supply drops to below 110V or (3), the surge associated with power coming back up after an outage may exceed the 110V that the unit was built to operate at and made worse when people ignore the "dedicated circuit" specification in the Installation Manual because everything sharing that circuit will be firing up at the same time. Ensuring the circuit is not only dedicated but also equipped with a power regulator or at least surge suppression will go along way to safeguard the compressor and digital controls. The Sentry III delays start-up following a power outage. It is recommended that a power surge protector is still used with this unit AND used with all our cooling units. Weight: 43 lbs. 49 lbs. 69 lbs. 70 lbs. A dedicated 15 amp circuit (units up to 4000 BTUs) or 20 amp circuit (units from 6000-8000 BTUs)is strongly recommended. If you require the cord out the back of the cooling unit, (plugging into room in adjacent warm space) please specify at time of ordering - standard configuration is plug in within the cellar. Warm side plug in is special order item. The Breezaire Products Company, located in San Diego, CA, California, United States of America, 92121 USA, creates a vast array of American made wine cellar cooling units, such as the WKL Series, which are great for your home or commercial use. 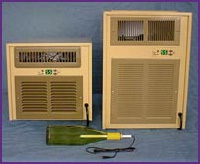 Breezaire WKL Series Wine Cellar Cooling Units are available for shipping within the USA and Canada.